How big of a deal is it? Scott Newnam, owner of a Audio Advice in Raleigh, introduced this concept to me that he picked up from the Disney Parks approach to guest services. Scott has implemented it with his team, and I think we would be wise to apply to our experiences, too. Not A Big Deal/Not Our Fault: The response is to apologize and redirect. Le't say your inspector calls to let you know he's 20 minutes late. You and the client are already there waiting. Apologize for the delay and redirect the client to taking care of loose ends on paperwork or take the time to educate them on the next step of the transaction. Not A Big Deal/Our Fault: Be quick to act, ... like right away. Do something. Let's switch the previous scenario. You're the one late to the inspection. Upon arrival, acknowledge the shortcoming and present a $10 Starbucks card to your client to say "I goofed." If you're going to adopt this method, it's a good idea to have a stash of those cards in your car for helping you solve little problems from time to time. Big Deal/Our Fault: we really want to make sure this doesn't happen, but if it does, let's own it. The key is to roll out the red carpet, maximizing your effort to provide a solution. Don't be afraid to get your team leader involved, too. Let's say you forgot to order the sign install on that big, new listing of yours. Oops. Client calls on day 3 to inquire. Ouch. What are you going to do? It is important to acknowledge the error, report within a short time of your corrective action, and then add something extra. Maybe you're going to pay for this week's yard service or cover the cost of title search at closing. The key is to demonstrate action and service rather than back peddling and excuses. Big Deal/Not Our Fault: This is the place where opportunity knocks. When we solve client problems that our not our fault, we add value to their experience. We create an event by which they will remember us, and they will be talking about it to their contacts. In short, it's the chance to create magic. To succeed here, takes time, planning and relationships. In our world this could be the moving company that fails to show for our sellers the day before closing. Definitely not our problem, but if we have built a strong relationship with our own moving vendor, then it's time to call in the favor. Imagine phoning your client with the news of that solution. Powerful. 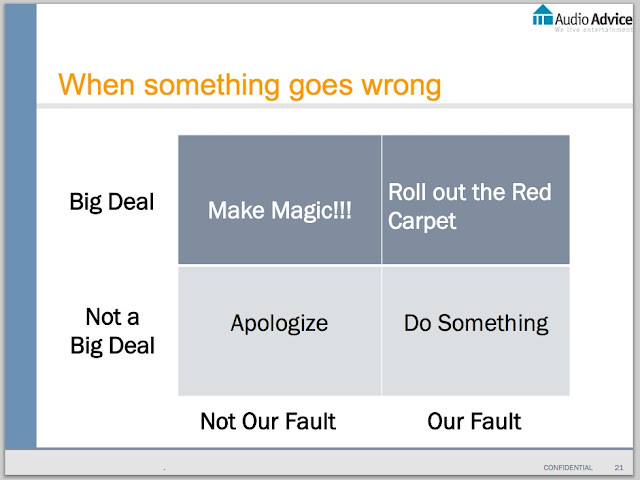 So give some thoughts to these clients-gone-wrong scenarios, and set up your game plan.